Former Tottenham manager Martin Jol paid tribute to Al Ahly's fans and players after guiding the club to Egypt's Premier League title in his first season in charge of the Cairo-based outfit. Ahly clinched the championship with a 2-1 victory over Al Ismaily in the Egyptian classico to win their 38th Egyptian league title with two matches of the season remaining. "I'm happy, this is the first league title for me, and I will not forget it all my life," Jol told reporters. The 60-year-old coach said bad luck had prevented his Ahly side from clinching the title weeks earlier, but felt the response to becoming champions was something he would always remember. "I thank my players and Al Ahly fans who support us all the time, especially before the Al Ismaily match when they attended the training session last Monday. "The atmosphere they made was unique and I'm proud of them," the Dutchman added. The victory put Ahly on 74 points, seven points ahead of second placed rivals Zamalek who won the title last year. 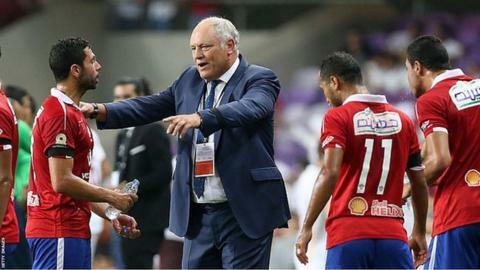 "Our team is the best and biggest team in Egypt and this title assured that for all the people here," said Jol. The former Tottenham and Fulham manager took charge of Ahly in February in mid-season, replacing Jose Poseiro. In his four months at the Cairo club, Jol has faced difficulties, travelling to Alexandria to play their home games behind closed doors on security grounds. "This title was not easy to win, it was very tough because of our injures and travelling every match to Alexandria - 200 Kilometres from Cairo - to play due to security reasons. "That made the players tired, and add to that the matches of the African Champions League, we used to play two matches every week," Jol explained. "The matches behind closed doors is painful and that is the toughest what I find here in Egypt. "I hope they allow fans back soon to the football matches, because it's for them we play football," Jol added. The Dutch coach will be hoping to add to the domestic title with Ahly, as they are still involved in the group stage of the African Champions League.